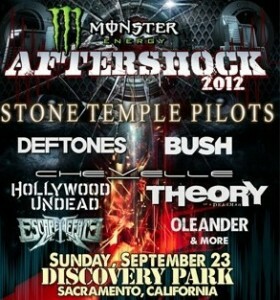 The long awaited Aftershock Festival had finally arrived. Took a 5 hour haul to Sacramento to witness some of the greatest bands around. But first…let me make a quick comment about the portapotties there. Run. The weather was overcast and mild; well at least for the first hour that we were there; then it became hot and humid. Thank God for the trees. This was the first time I had been to Discovery Park, so I just took a moment to soak it all in. The vendors were geared up and ready on both sides of the park ready to take on the crowd. Beer booths and junk food as far as the eyes could see. Pure bliss. We started heading to the main stage while carefully dodging all the blankets that were laid out on the ground. Once we got there we ran met up with John Boyle, promotion director at 98 Rock KRXQ in Sacramento. As expected, John was making sure everything was going smoothly, so we just sat back and watched him run the course. Being backstage is really an experience. We got to witness the meet and greets with the bands and fans. It was exciting to see the look of anticipation on the peoples’ faces knowing that they are going to meet their icon face to face. This is when the photo frenzy begins. The sound of Chevelle’s sound check made us take notice. All the photographers started lining up in the photo pit preparing to get that great shot. The screaming of the crowd began as Chevelle drummer Sam Loeffler hit the stage followed by bassist, Dean Bernardini and front man Joe Loeffler. Starting the set off with Sleep Apnea, Chevelle’s performance was nothing short of incredible. Chevelle’s slight rendition change of The Red which consisted of a partial acoustics was a nice changeup. If you haven’t had the chance to see Chevelle play; I highly recommend it. Next to step foot on stage was Bush …what can I say? As soon as Gavin Rossdale comes on, the shirts come off. Bush busts out their hit song, Machinehead followed by All My Life and The Chemicals Between Us and continuing on with a cover classic song by the Beatle’s, Come Together. Rossdale surprised the crowd as he made his way through the ground clutter of blankets, cups and plates to a cement haven that was located to the left of the park to give the nose bleed fans a closer look. The sound was superb, song selection was amazing and Gavin Rossdale, Chris Traynor, Corey Britz and Robin Goodridge put on yet another grand performance. Post-grunge Sacramento band, Oleander was included on this year’s festival’s ticket with some great guitar work by Rich Mouser and Ric Ivanisevich. Tom Flowers put on an impressive performance with his smooth singing ability. It was like cutting through butter. Drummer Steve Brown played effortlessly as expected with Doug Eldridge smackin the bass like it needed it. The guys were flawless. Deftones….WOW. What a display of musicianship. Front man Chino Moreno just blew me the hell away. That dude can knock the stripes off a zebra with his singing capability. Just amazing. The whole band was incredible. The bass was so thick and powerful that you could literally feel it in your chest. Kudos to Sergio Vega for stepping in for Chi Cheng while he recovers and to Steve Carpenter and Abe Cunningham for putting on an amazing show. You know it’s a great event when people are getting carried out on a stretcher. Thanks again to Clay Busch at Arms Division for letting us cover this event.